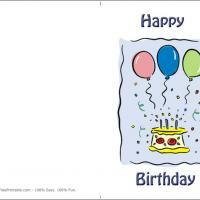 These printable birthdays cards let you send a message of sunny love to all those you care about! A bright sunflower dominates these free printable cards against a blue background with soft yellow text. It's the perfect card for all those who love the sunshine! Want to add a custom touch? It's easy to put in your own additional designs such as a colorful background, drawings and more sunflowers! Don't forget your personal messages on the inside cover. 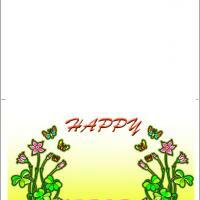 Your recipients will surely appreciate all of your efforts and will love this sunny card. It will give them a brighter outlook for the day! Sunflowers are as golden as the sun's rays in the morning. 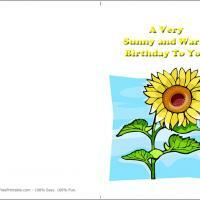 Send our Sunflowers free printable birthday card to someone on your list to brighten and lift their day. The tall strong stalk of green is crowned with a bright yellow burst of the Sunflower bloom. It is set off by a sky blue background as if it was still in the field. A cheery yellow sentiment rounds off the front cover, only to lead you into the blank insides just waiting for your personal message. Our free printable cards are so easy to use and custom print right from your home. 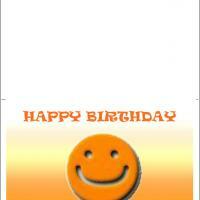 Want to send a card to wish someone a happy birthday as well as add some extra sunshine to their special day? 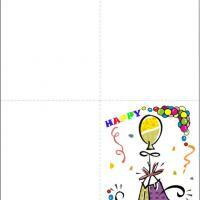 Our Sunflowers free printable birthday card is just the answer. The sky is blue and the bloom is golden. The yellow kind words of warm wishes spread sunshine everywhere. The large Sunflower is symbolic of happiness and love. Select the Sunflowers card from our large selection of free printable birthday cards and you are on your way to having a card custom printed with your personal message of warmth and love inside. They will be surprised to see how beautiful this card is to display on a table top or in a frame.